This passionate “expertise manifesto” is intended to elevate the impact of advisors who sell insight as entrepreneurs. Three foundational chapters form the basis of the entire book: experts develop insight by isolating patterns in data; they convert those insights to wealth by crafting a unique positioning for which few available substitutes exist; and their confidence grows as the marketplace embraces their application of expertise. The next sixteen chapters—building on that foundation—each answer a single question, starting with the role of expertise in a developed society, how important it is for experts to love the hard work required to hone their expertise, and how to see all that in the context of their own purpose in the world. 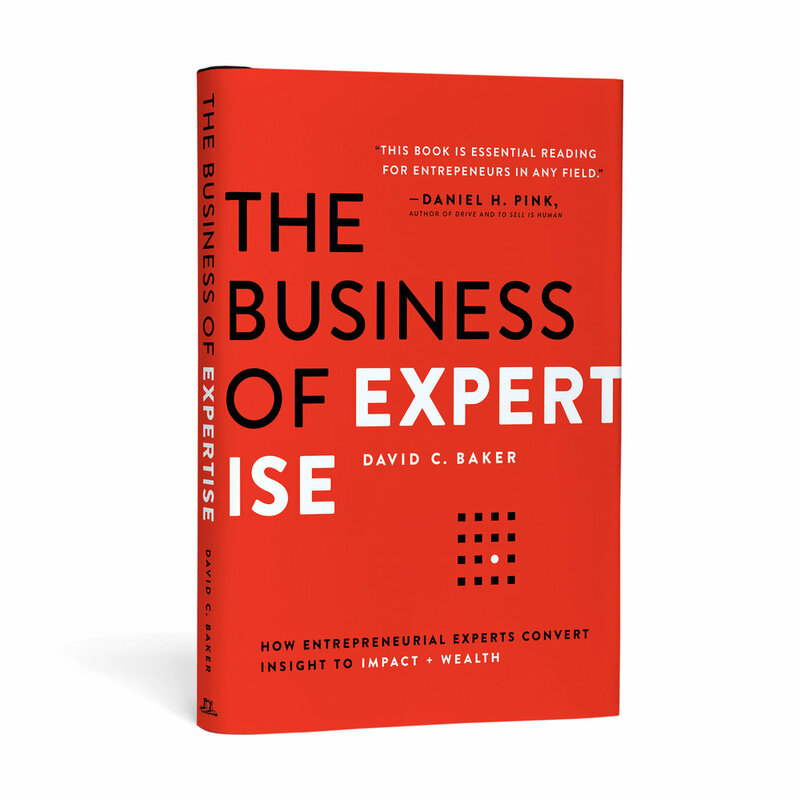 We pause to dig deeper by examining the very narrow overlap between expertise and entrepreneurship: the narrow slice of humanity for which this book was written, with a nod to how easy it is for those entrepreneurial experts to be pulled off mission to explore new things. What are the critical positioning mistakes to avoid? Are there helpful ways to keep your deep, narrow expertise from blinding you to a broader, wider relevance? How might you frame your expertise in horizontal or vertical terms or a combination of both? There are core principles for this and they start with distinguishing between strategy and implementation. What are the earlier and then later tests to validate your positioning? What are the most effective ways to demonstrate your expertise, and conversely the activities most important to avoid? If you are an entrepreneurial expert selling advice for a living, you’ll absorb deeper and deeper insight each time you scour it. It emerges from the trenches, and is written for experts in the trenches. Blair asks David about his new book, the authoring process, publishing, and the book's topic on their podcast, 2Bobs. David grew up with a tribe of Mayan Indians in a remote village in the highlands of Guatemala. He’s an author, speaker, and advisor to entrepreneurial experts. This is his fifth book. He’s a helicopter and airplane pilot, an avid photographer, and taught high performance motorcycle riding/racing. Based in Nashville, he has visited and worked all over the world. He is married, has two boys, two daughters-in-law, and multiple grandchildren. His work has been featured in the WSJ, Fast Company, USA Today, Inc. Magazine, and Forbes. He speaks regularly at various TEDx events, Harvard, Adobe, and major international conferences to audiences looking for accessibly refreshing insight into how experts shape their world. David is available to speak at any event, public or private, anywhere in the world. He has traveled and worked in nearly 50 countries. David typically provides keynotes, and occasionally large breakouts. He only appears on panels with other published authors. Speaking fees are $10,000-40,000, depending on audience, length of presentation, audio/video rights, and travel difficulty. Expenses include Four-Star hotel and first/business class on Delta or American or equivalent. In some cases, bulk purchases of the book, typically for distribution to the audience, can be substituted for the speaking fee. Speaking fees and an estimate of expenses must be received ten days before the contracted event. The speaking fee is waived in rare circumstances that make sense for both parties. Significant discounts are available for certain orders: ▪	20 copies or more ▪	Prepaid: credit card, check, wire transfer ▪	Non-refundable, non-returnable (except defect) Shipping to anywhere in the world; actual shipping costs extra. Thank you! We'll get back to you about your inquiry.